Living in Florida and having fair skin, I have always been very vigilant about protecting my children from the sun. Unfortunately, I personally experienced many bad sun burns as a child and at age 38 (a few months ago) I was diagnosed with skin cancer. Thankfully, it was treatable and it has made sun protection even more important to me. Making it even more critical for my three year old son is that he is recovering from third degree burns he received in a campfire accident a year ago and his arm scars cannot receive any sun at all or it can cause further damage to his skin. Fortunately, I discovered Sunny Sleevez which is a fantastic resource for sun protection for adults, children and babies. 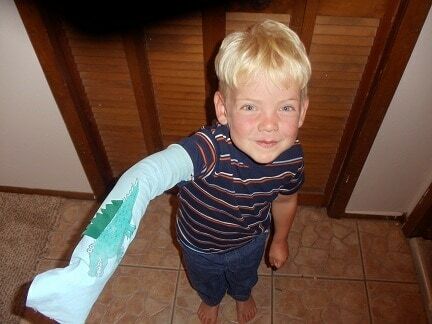 My son has been wearing a pressure garment with a modified sock (we cut off the toe) over his arm every day. Sunny Sleevez allows us to throw out those unsightly socks because this effective garment is a sun sleeve that blocks out 99% of UVA and UVB rays and it does it in style! My son was so excited when he tried on the Crocodile 3D theme Sun Sleeve. It is very lightweight so his arm stayed cool without dripping uncomfortably with sweat. I love that it provides 50+ UPF and it fits nicely with an elastic non-slip band at the cuff. It stays up surprisingly well and only rarely do we have to adjust it when he is taking part in vigorous activity so I was really impressed. It also has the option of looping it with a button at the top for an even better fit (available in children’s small and medium sizes). My son loves that it covers the wrist area loosely (this is where he has the majority of the scarring) so it feels good when he is wearing it. Taking care of our Sun Sleevez is very easy, I just machine wash it in cool water and let it air dry. Sun Sleevez are available in a wide range of colors and styles so it is appealing to everyone and I was surprised at how affordable it is to purchase a pair of Sun Sleevez starting at only $14.99 for children’s sizes and $24.99 for adults. Sunny Sleevez also has stylish color change jewelry that kids (and adults) will be begging to wear. What makes these bracelets and necklaces “magical” is that it changes color from off-white to bright colors when the sun’s rays are brightest alerting me to the presence of harmful UV rays. It really does work and my children find it fascinating to see how the sun’s rays work to change the colors. I feel confident that my children are protected from the sun but there have been occasions (such as a cloudier than normal day) that I falsely assumed it was “okay” to go outside without protective sunscreen and clothing but the bracelet indicated high UV rays. You can view the entire collection, which is very affordably priced at the Sunny Sleevez website. I am really pleased with the products that I have tried from Sunny Sleevez and I have been telling all of my family and friends about it so that they can protect themselves and their families. I will be purchasing more Sun Sleeves for myself, my husband and my two older children too and look forward to trying new products from this company. You are invited to visit the Sunny Sleevez website to view the entire collection and while you are there check out some of their amazing specials available online to help you save even more while protecting your own family. Connect with Sunny Sleevez on Facebook.